NewWindow: returns the dock window that is about to become active. OldWindow: returns the currently active window. 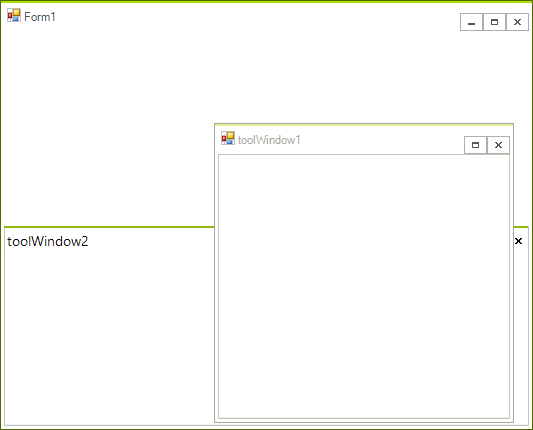 In the picture below the currently active window is toolWindow2. Activating toolWindow1 will cause ActiveWindowChanging to fire, and we can expect NewWindow to return toolWindow1 and OldWindow to return toolWindow2. DockWindow: returns the activated window. Considering the same scenario, where the currently active window is toolWindow2, activating the toolWindow1 will first fire ActiveWindowChanging and if it is not canceled, ActiveWindowChanged will be fired. There, the DockWindow property from the event arguments will return toolWindow1. In this case, you may also use RadDock.ActiveWindow that will also return toolWindow1.